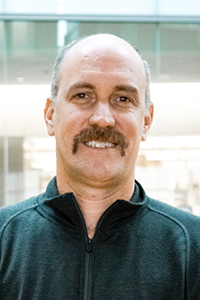 James Dowell's research is focused on the application of mass spectrometry-based proteomics to the identification of novel mechanisms of chromatin remodeling. Specifically, Dowell is developing novel proteomics methodologies to identify histone post-translational modifications and decipher their role in chromatin remodeling. Sturm, RM. Dowell, JA. Li L. (2010) Rat brain neuropeptidomics: tissue collection, protease inhibition, neuropeptide extraction, and mass spectrometric analysis. Methods Mol Biol. 2010;615:217-26. Dowell, JA. Johnson, JA. and Li, L. (2009) Identification of astrocyte secreted proteins with a combination of shotgun proteomics and bioinformatics. J Proteome Res, 2009 Aug;8(8):4135-43.